When Robert McNamara moved from president of Ford Motor Company to secretary of defense in 1961, he brought his very active management control and systems-planning philosophy to the Kennedy administration. Reports from mid October 1962 confirmed that the Soviet Union was installing intermediate-range nuclear missiles in Cuba, ninety miles off the shore of Florida. McNamara recalls this pivotal moment in the Cuban missile crisis and reads from the first of two letters that Soviet general secretary Nikita Khrushchev sent President John F. Kennedy. After careful deliberation, the president and his advisers crafted a reply that became the turning point in the crisis: it triggered Khrushchev's decision to remove missiles from Cuba. The period from November 1962 to the end of the Cuban missile crisis is generally seen as the most dangerous period of the entire Cold War. In his interview conducted for War and Peace in the Nuclear Age: "At the Brink," McNamara traces the thirteen-day crisis that closed this chapter: the secret, high-level debates within the Executive Committee; his firm oversight of the quarantine of Soviet ships heading to Cuba; the U-2 reconnaissance plane lost over Siberia; and the pressures for prompt military action that mounted daily. McNamara concludes with lessons he learned from the crisis, which he regards as the "watershed that divides the pre-nuclear and the nuclear age." 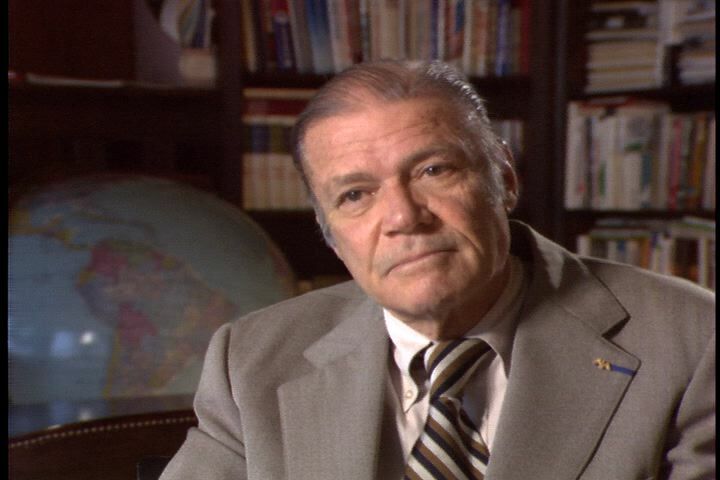 Chicago: “War and Peace in the Nuclear Age; Europe Goes Nuclear; Interview with Robert McNamara, 1986 ,” 02/20/1986, WGBH Media Library & Archives, accessed April 25, 2019, http://openvault.wgbh.org/catalog/V_DF35A31CD90545FE83A077DE010DD044. MLA: “War and Peace in the Nuclear Age; Europe Goes Nuclear; Interview with Robert McNamara, 1986 .” 02/20/1986. WGBH Media Library & Archives. Web. April 25, 2019. <http://openvault.wgbh.org/catalog/V_DF35A31CD90545FE83A077DE010DD044>.